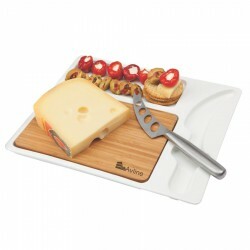 Branded cheese sets are valuable for corporate or executive gifts. When you are looking to make an impression, whether to your customers or employees, you will find promotional cheese sets to be cost-efficient and effective. Printed with your corporate name or logo, you can boost your image. Our collection of excellent quality branded cheese sets is guaranteed to offer you several best value options. A corporate gift favourite is our executive wooden cheese board set which is presented in a magnetic gift box. For giveaways, we have custom 4-setting cheese board sets in convenient carry bags. We also have promo cheese sets designed for outdoor parties and meetings. Check out our entire selection below. 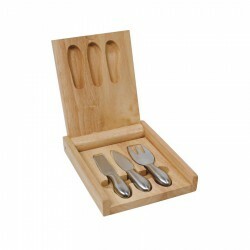 Heavyweight wooden set with three stainless steel cheese knives. Black magnetic gift box. Heavy wooden base with unique swivel action revealing a compartment holding four wooden handled utensils. Boxed. Round wooden cheese board set. 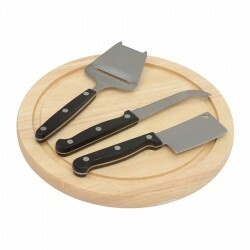 Cheese scraper, knife and cheese block cutter. Boxed. This handy set is perfect for any picnic. Made from 600D woven polyester it contains cutlery for 4 people, cutting board and napkin. 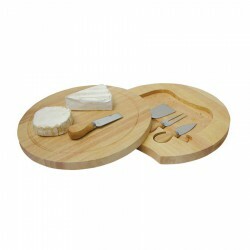 This laminated cheese board is made from bamboo and comes with three stainless steel cheese slicing utensils. Packaged in a two part gift box. Features: Includes cheese slicer, cheese knife and hard cheese knife. 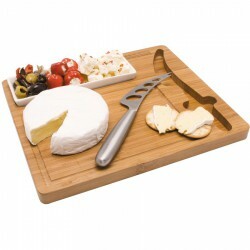 Slate Cheeseboard, Paring knife & chalk to write your favourite cheese names, Handwash only, Supplied in Jamie Oliver packaging. 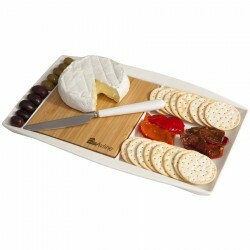 Beautifully packaged set with the cheese board recessed into the lid and accompanied by 4 cheese knives.. Features 2 acrylic glasses, cheese board, cheese & pate knife, 2 forks, wine waiters tool, 2 serviettes, in black 600D polypropylene and 2 tone material trim. In a polybag. 3 piece stainless steel hollow handle cheese knives, Knives recessed into Bamboo board with tempered glass. Lined box, 3 cheese knives, Supplied in gift box. Black zippered pouch with white stitch trim, White plastic cheeseboard, cheese & pate knife, 2 forks & waiters tool. Party Plate combines stylish ceramic with environmentally friendly bamboo. Used around the office and at home this is the ideal product to feature your logo. Because of the unique nature of bamboo, the product and engraving colour may vary from item to item. This eco-friendly cheeseboard is a stand-out. The beautifully-crafted bamboo board features a ceramic snack bowl and stainless-steel cheeseknife all supplied in a natural-coloured gift box. 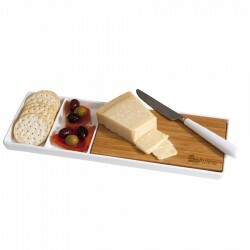 Jumbo Party Plate combines stylish ceramic with environmentally friendly bamboo. Used around the office and at home this is the ideal product to feature your logo. Because of the unique nature of bamboo, the product and engraving colour may vary from item to item.